We are still busy whipping things up in the kitchen around here. Last week I made lots of pans of chocolate fudge, and got it in the mail to Laura, and my son, Mike. I have made my fudge for 34 years I think, and it just wouldn't be Christmas without it. But it's definitely fun to change things up, and try something new. 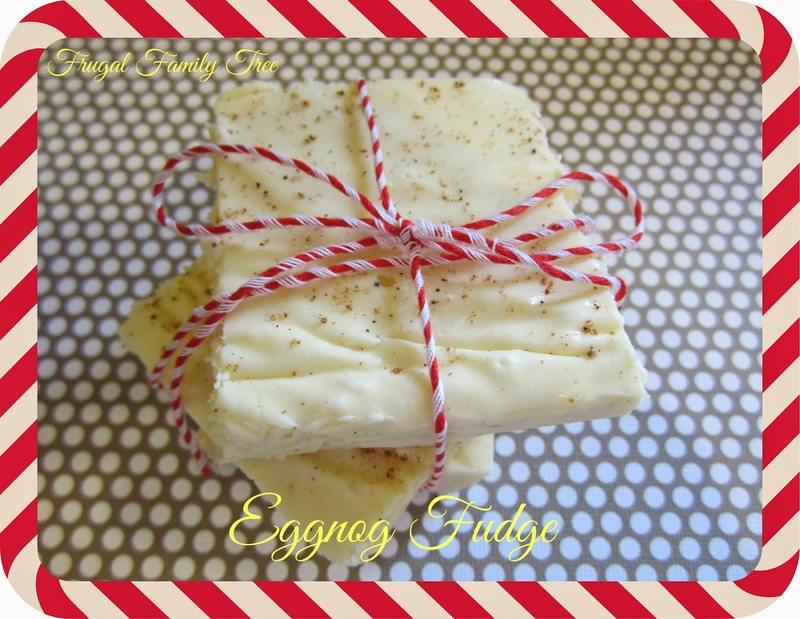 Samantha made this Eggnog Fudge yesterday, and it is just fabulous. It is really creamy, and the eggnog flavor is delicious. This recipe will be added to our yearly must-make list, for sure. I know we are getting short on time here, but this fudge is so worth whipping up at the last minute for friends and family to enjoy. And of course, it would be great at New Years, too. Line a 8 or 9-inch pan with foil and let it hang over the sides. In a heavy 3-quart sauce pan, combine sugar, butter, and eggnog. Bring slowly to a rolling boil. Continue boiling over a medium heat for 5 minutes, stirring constantly to prevent scorching. Remove from heat. Use a wooden spoon to quickly stir in white chocolate and nutmeg until it is melted and smooth. Stir in marshmallow crème and rum extract. Pour into pan. Sprinkle a light dusting of nutmeg on top of fudge. Let fudge cool completely before cutting. Makes 20-30 pieces, depending on cut size.